A couple of days ago it was reported that ApplnBerry new Gevey SIM to unlock iPhone 4 on baseband 04.11.08, iOS 5.0.1 was in was in testing stage. Well, it turns out that the new Gevey SIM they were testing was a new interposer to unlock the iPhone 4S on iOS 5, 5.0.1 basebands 1.0.11, 1.013, 1.0.14. The new SIM interposer called GEVEY Ultra S for iPhone 4S was announced and made available for pre-order today. This interposer will unlock your iPhone 4S (GSM only) on any of the current basebands. The interposer is very easy to used and brings many improvements over the previous Gevey SIM, GEVEY Ultra , ApplenBerry released last year to unlock the iPhone 4 on any baseband that were introduced in iOS 4 – 4.3.5. One of the major advantages this SIM has over the previous one is that all you have to do is pop in your SIM card with the interposer and no need to jailbreak the device or download any extra software from Cydia or the computer. Dialing emergency number 122 is no longer required as the previous SIM did. 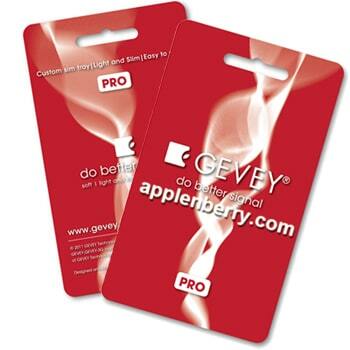 Data connection such as 2G or 3G speed is also to work with Gevey Ultra S. ApplnBerry claims that the Gevey Ultra S decreases the power consumption and has better reception over the Gevey Ultra for iPhone 4. Gevey Ultra S for iPhone 4S is for GSM iPhone 4S models only, but ApplenBerry says that a CDMA (Sprint, Verizon) version is also being worked on. You can pre-order this unlocking solution for your iPhone 4S at ApplenBerry.com for a price of $54.99, and should arrive during March 3- March 7.